For a brief introduction to the Bethe-Salpeter equation and the details of its implementation in GPAW, see Bethe-Salpeter Equation - Theory. We start by calculating the ground state density and diagonalizing the resulting Hamiltonian. Below we will set up the Bethe-Salpeter Hamiltonian in a basis of the 4 valence bands and 4 conduction bands. However, the screened interaction that enters the Hamiltonian needs to be converged with respect the number of unoccupied bands. The calculaton is erfored with the following script gs_Si.py. It takes a few minutes on a single CPU. The last line in the script creates a .gpw file which contains all the informations of the system, including the wavefunctions. This should finish almost instantaneously. The parameters that needs to be converged in the calculation are the k-points in the initial ground state calculation. In addition the following keywords in the BSE object should be converged: the plane wave cutoff ecut, the numbers of bands used to calculate the screened interaction nbands, the list of valence bands valence_bands and the list of conduction bands conduction_bands included in the Hamiltonian. It is also possible to provide an array gw_skn, with GW eigenvalues to be used in the non-interacting part of th Hamiltonian. Here, the indices denote spin, k-points and bands, which has to match the spin, k-point sampling and the number of specified valence and conduction bands in the ground state calculation. For large calculations, it may be useful to write the screened interaction, which is the first quantity that is calculated and may be restarted in a subsequent calculation. This may be done with the keyword wfile='W_qGG.pckl', where the .pckl file contains the screened interaction matrices at all q-points and a few other variables. It may also be useful to set write_h=False and write_v=False, since these files may become quite large for big calculations. The screening plays a fundamental role in the Bethe-Salpeter equation and for 2D systems the screening requires a special treatment. In particular we use a truncated Coulomb interaction inorder to decouple the screening between periodic images. We refer to Ref. 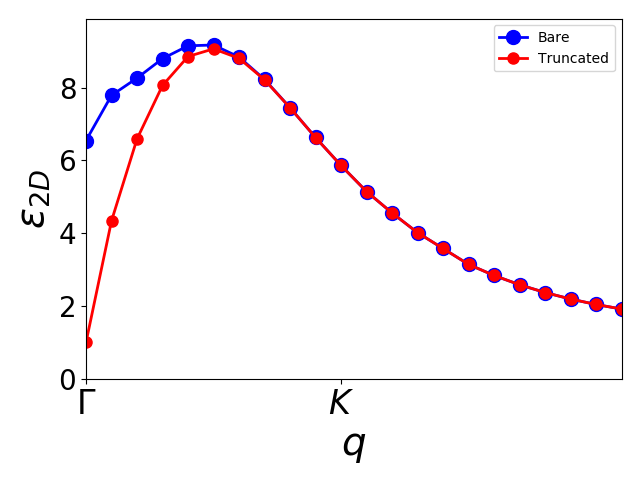 for details on the truncated Coulomb interaction in GPAW. As before, we calculate the ground state of \(MoS_2\) with the script gs_MoS2.py, which takes a few minutes. Note the large density of k-points, which are required to converge the BSE spectrum of two-dimensional systems. The macroscopic dielectric function is calculated as an average of the microscopic screening over the unit cell. Clearly, for a 2D system this will depend on the unit cell size in the direction orthogonal to the slab and in the converged limit the dielectric function becomes unity. Instead we may calculate the longitudinal part of 2D polarizability which is independent of unit cell size. This is done in RPA as well as BSE with the scripts pol_MoS2.py, which takes ~20 hours on 16 CPUs. 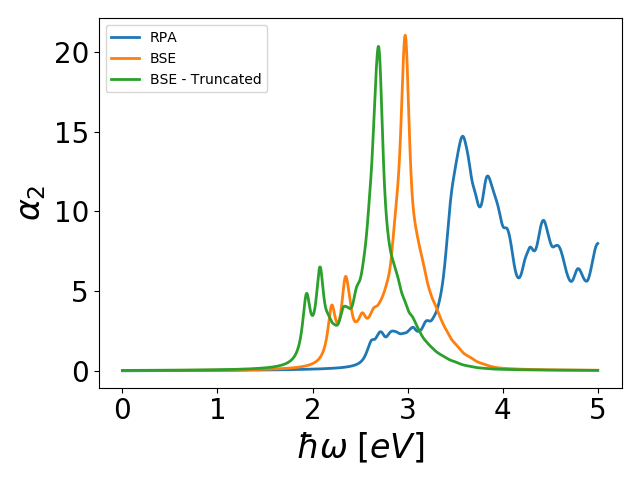 Note that the BSE polarizability is calculated with and without Coulomb truncation for comparison. In both case spin-orbit coupling is included through the spinors keyword. We refer to Ref. for details on the spin-orbit implementation. The results can be plottet with plot_MoS2.py and is shown below. The excitonic effects are much stronger than in the case of Si due to the reduced screening in 2D. In particular, we can identify a distinct spin-orbit split exciton well below the band edge. 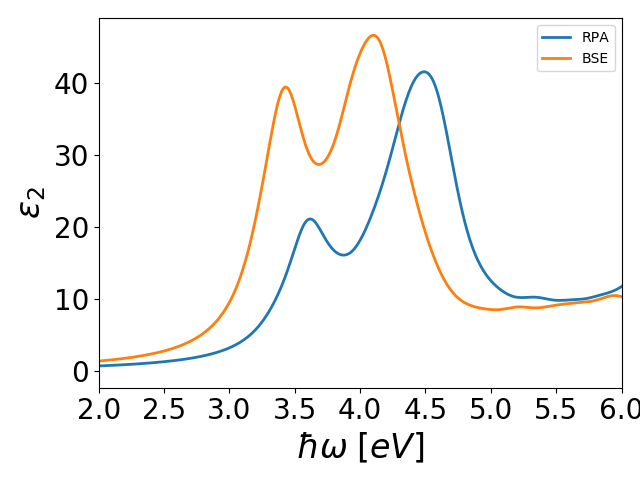 Note that without Coulomb truncation, the BSE spectrum is shifted upward in energy due the screening of electron-hole interactions from periodic images. The script get_2d_eps.py carries out this calculations with and without Coulomb truncation and the result is shown below plot_2d_eps.py. Note that the truncated screening is bound to become one at \(\Gamma\) due to the different behavior of Coulomb interaction (in \(q\)-space) in 2D systems. For small values of \(q\) the screening is linear, which makes convergence tricky in standard Brillouin zone sampling schemes. Since the \(\Gamma\)-point is always sampled, the screening is typically underestimated and the exciton binding energy is too high at finite \(k\)-point samplings.